It’s been ages since I’ve done one of these little Chicago roundups, but there are so many head-splittingly good things going on this week that it seems like a dandy time to reinstate the tradition. 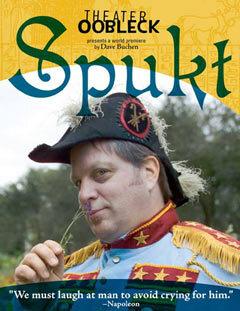 â€¢ First up, this weekend is the opening of the brand-new Theater Oobleck show Spukt, written by the mercurial Dave Buchen. It’s got a top-shelf cast that includes David Kodeski, Guy Massey, Diana Slickman, Rachel Claff, and Michael Brownlee, with music by Christopher Schoen, Tony Atoms, and Heather Riordan (on the squeezebox, I assume). Spukt uses Napoleon’s 1798 invasion of Egypt as a jumping-off point for Oobleck’s usual sharp mix of politics, satire, and surrealism. Speaking as an erstwhile Oobleckian myself, I think this one looks like a don’t-miss. Admit it, you’ve been dreaming of David Kodeski in a little Napoleon suit for months now, and finally you have a way to explain it! $12 suggested donation, more if you got it, free if you’re broke. Please make reservations by e-mail, or if it’s less than 24 hours before the show, by phone at 773-347-1041. More info at TheaterOobleck.com. But wait, there’s more! The special 2pm Sunday matinee performance this weekend includes a discussion with Juan Cole, one of the smartest guys on the whole darn Interweb, and the author of the book Napoleon’s Egypt: Invading the Middle East. The discussion will be moderated by Chuck Mertz, host of the This Is Hell radio show on WNUR-FM. Sunday matinees aren’t usually my scene, but I think I’m gonna try to make it to this one. â€¢ Meanwhile, the Sweat Girls, Chicago’s wildly popular all-female monologue troupe, are in the midst of the run for their latest show Sweatily Ever After up at the Raven Theatre at Clark & Granville in Edgewater. I caught the show opening weekend, and although (full disclosure) I am the Girls’ Webmeister so I might be an eeeeensy bit biased, I found it to be their usual entertaining and poignant mix of disarmingly direct personal storytelling and charmingly salty humor. And I have to say the music for this show is just superb. The Sunday matinees include a special prologue dance by Julia Mayer, called Once Upon. You’ve got one more weekend after this one â€” go see it. â€¢ Back in the mid-90s when the MCA hosted that fabtrabulous Fluxus exhibition that originated at the fabtrabulous Walker Art Center, many of the then-current Neos spent a lot of very happy time playing there, sticking our hands into mysterious boxes, playing strange objects pressed into service as musical instruments, and reading all of Ben Vautier’s brilliant little notes from the storefront window where he installed himself as a Fluxus happening. For those of us already familiar with Fluxus, it solidified a sense of the connection between what the Fluxians had done in the 60s and what The Neo-Futurists were doing in the 90s. For others it was a source of new inspiration. As an old Yoko Ono fan, the show gave me a new sense of context for the humor and imagination of her art-world work. At any rate, Greg Allen is doing his best to recreate the Fluxus magic under the Neo-Futurist roof with the newest show over at The Neo-Futurarium, Mr. Fluxus. It opened last weekend and runs through December 8. I haven’t seen it yet, but Jim over at empty-handed.com gives it a thumbs up, and you know how much he hates The Neo-Futurists. It’s the first and only site that offers custom weekly horoscopes based on your exact time/place of birth (as in real astrology). The forecasts are emailed (by me) to your inbox every Sunday. I offer a free, four-week, no-strings-attached, no credit-card-info-taken trial. And if you want to buy it’s dirt, dirt cheap. Andy really does his homework and if you’re an astrology-receptive person, I think you’ll enjoy what he does. Pay him a visit to learn more. The reading is this Wednesday evening, November 14 at 7:30pm, and full details are on the Women and Children First site.